SIMS Grade 8 boys basketball team after winning the mid-island championships in Duncan on Friday. 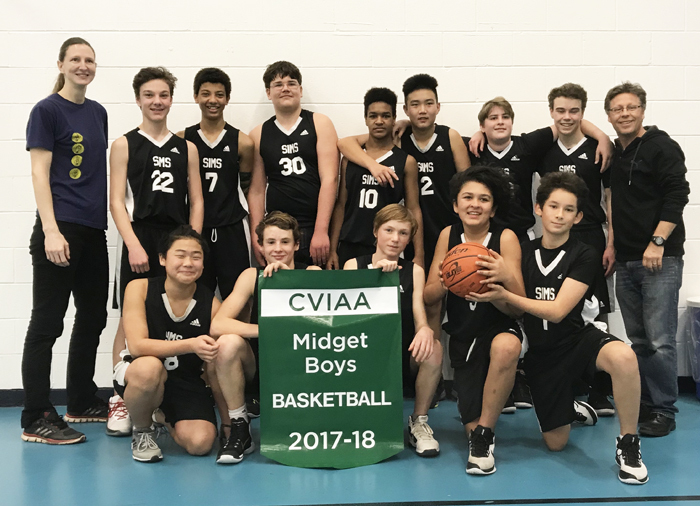 Salt Spring Island Middle School’s Grade 8 boys basketball team won the mid-island championship title on Friday. “They have had a stellar basketball season,” said SIMS teacher and team co-coach Jude Shugar. As the number-one seed in the tournament, the boys had a bye in the first game played at Islands Savings Centre in Duncan. SIMS won handily against Cowichan in the first game, said Shugar. The boys then faced Frances Kelsey in the final, which proved a tough battle. The team now waits to hear if they will play the top team in either the north or south island championships for a potential berth at provincial championships at the beginning of March. The boys had an undefeated regular season and are an impressive group, said Shugar. Annette Wright is the team’s other coach.